This is the best portrait of Rembrandt of the 1850s. We see a man who has lived a long life full of difficulties. On his face you can see traces of heavy thoughts and incredible difficulties. Incredibly deep wrinkles pierced his forehead. His look is tired. Hands lie quietly on his lap. But in the whole guise of this person one can feel the inner strength and power of the soul. Initially, the researchers were confident that this portrait depicted a famous sage. We see a person who has accumulated considerable experience in his entire long life. Rembrandt creates the most expressive image of the strength, using the usual techniques. The hero is in the center of the canvas, it is framed by the back of the chair. Clothing falls large folds. You can see that he looks very calm. These concise details create a genuine monumentality of this masterpiece. The language of the artist is flexible and rich. We see this in the features of the letter, as well as in the masterful game of fairy-tale light. Where the light reigns, the colors are deliberately thickened. Where the shadow lives, they are very thin and almost transparent. When light suddenly comes in here, its magical crushing occurs. It seems that the whole image is surrounded by a vibrating light and a bizarre environment consisting of air. The spectators have the feeling that the old man’s face is alive. It changes and emits a special light. Portrait of an artist imbued with the most vibrant life. His hero is outwardly calm, but this does not mean that he is motionlessly frozen. 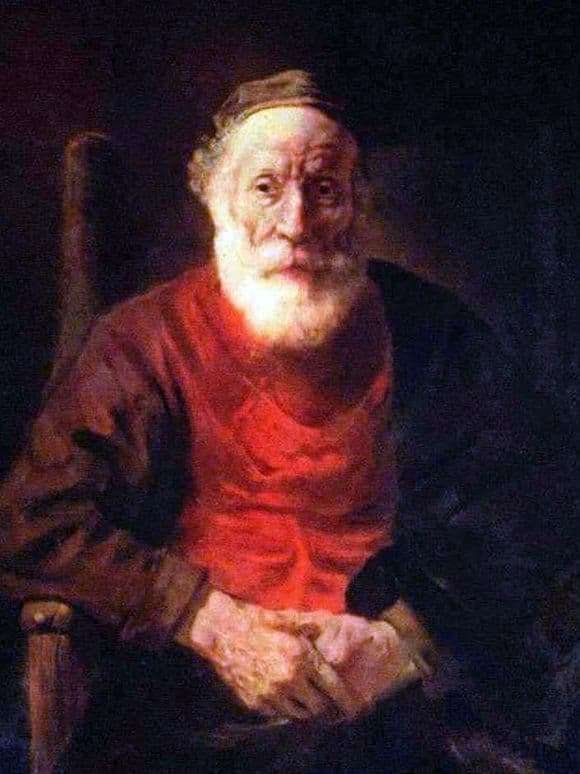 Rembrandt is a true master. He was able to convey through visible calm the psychology of the old man, his thoughts and experiences. In the portrait all times are connected. The master was able to create an image that personifies incredible resilience. In this case, a person takes the fate that is prepared for him.